This Spartanburg, South Carolina hotel offers a free breakfast, free high-speed internet access and a free airport weekday shuttle to Greenville-Spartanburg International Airport. The University of South Carolina is nearby. Every room at the Hampton Inn & Suites Spartanburg/I-26/Westgate Mall comes with a coffee maker, a microwave oven and a mini-refrigerator. All rooms include cable TV with in-room films and a work desk. 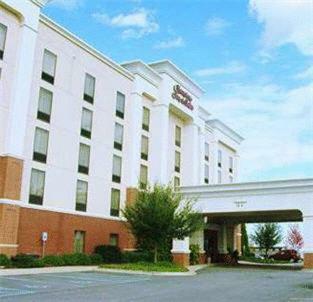 The Spartanburg I-26 Hampton Inn & Suites hotel features a fitness room and an indoor pool. The hotel offers luggage storage and laundry services. An on-site convenience store is available as well as a multilingual staff. Denny’s Headquarters is just minutes from the Westgate Mall Hampton Inn & Suites hotel. Hatcher Gardens and the Walnut Grove Plantation are within driving distance of the hotel as well. Please note airport shuttle times are limited. Contact property for further details. Guests are required to show a photo identification and credit card upon check-in. Please note that all Special Requests are subject to availability and additional charges may apply. the hotel Hampton Inn & Suites Spartanburg-I-26-Westgate Mall so we can give you detailed rates for the rooms in the desired period.